Imagine President Trump could directly control how many jobs the American economy produces. He would no doubt want to see tens of millions of more jobs before the next election, more than any other administration in American history. To be sure, presidents control some parts of the job creation process. They can set tariffs on goods produced overseas, eliminate onerous regulations and generally give consumers confidence about the future. And they certainly campaign on the economy. President Trump kicked off his State of the Union by pointing to job creation numbers during his tenure. U.S. presidents don’t really control how many jobs get created in the economy, and yet job creation is a constant campaign theme. 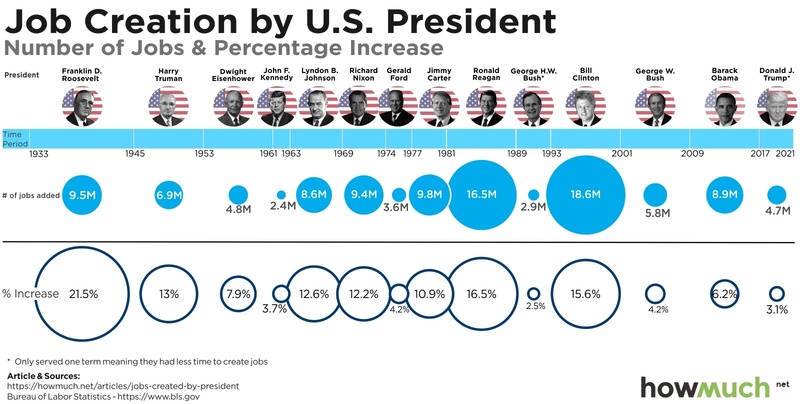 Our analysis of data from the U.S. Bureau of Labor Statistics ranks each president since World War II, letting you see for yourself who has the best track record. The economy under President Clinton created more jobs than any other administration, and FDR oversaw the highest percentage increase in the workforce. Job growth boomed from the 1960s through the 1990s, before tapering off over the last 19 years. We created a timeline of official numbers from the U.S. Bureau of Labor Statistics over the last several administrations, going all the way back to FDR in the Great Depression. Thanks to the researchers at The Balance for originally gathering the data. We plotted a series of bubbles indicating both the overall number created and the percentage change in job growth. This lets you easily and see how presidential track records compare against each other. The overall number of jobs created is the easiest statistic to grasp, but there are a few things to keep in mind. For starters, the U.S. economy grew throughout the years represented on our timeline. The labor force is much, much bigger today than 30, 50 or 70 years ago. That means it’s more common to see millions of jobs created each year than before. The economy generated 304,000 new jobs just last month alone. Our numbers also ignore recessions and depressions, when lots of people lose their jobs. President George Bush lost a lot of jobs after the 2001 recession, to say nothing of the Great Recession in late 2008 and 2009, which technically happened under Obama. Usually, there’s a surge of hiring in the years following an economic contraction, which typically makes up for any job losses and then some. That partly explains why so many jobs were created under FDR, to say nothing of the country’s focus in producing weapons for World War II. The percentages tell a deeper story. For example, President Obama oversaw 8.9M in job creation, only 6.2% growth. FDR, on the other hand, oversaw 9.5M, an incredible 21.5% growth. Granted, FDR was in power longer than Obama, but the point still stands. President Reagan deserves special mention because he oversaw the best percentage job in the post-World War II era. Clinton came close at 15.6%, but Reagan was clearly the best. Republican or Democrat, politicians like to take credit for things when it’s convenient. Job creation is difficult if not impossible for one person to directly control. As the 2020 campaign season gets underway, at least now you will have the real numbers to decide who’s right.